All individuals involved during the special education process, are considered stakeholders within IEP meetings. During the IEP meeting, it’s essential that all stakeholders are involved in the development of the individualized education plan (IEP). Per IDEA (2004) all members are to be included and work cooperatively on behalf of the best interest of the student, meaning that all individuals be invited, included, and made to feel knowledgeable. Sadly, not all individuals within an IEP meeting will be familiar with learning theories and how they can be applied within the IEP to support the students in their learning environments. In this scenario, some stakeholders may look to administrators or the special education teacher for support. When the administrators and special education leaders provide support by offering their input and insight into the special education process as well as the learning theories it can allow other members of the team to feel empowered to provide their input into the plan. The world of special education can be very murky and extremely tough to follow. General educators that feel more knowledgeable about the special education process and theories are more likely to provide input in the meetings. The style of instruction indicated on the IEP may be connected and influenced by the different learning theories. Considering the results of the student’s evaluation, it is vital to create a plan that will support the student’s needs. When considering the services, it is important to contemplate how it will be applied in the classroom. The services written within the IEP can be directly aligned to learning theories that may support the student. For example, a student that is displaying behavioral problems within the classroom may be provided with behavioral support where they are taught new replacement behaviors. These behaviors will be directly observable and measurable and therefore follow the format of behaviorism learning theory. IEP services and the connection to learning theories should ensure that students are receiving services based on their needs. When students are identified for special education services, it is vital that they receive the most appropriate services. Educators can help support students by being informed about strategies, learning theories, and services that can best support their needs, while also supporting others that may not have the knowledge of the theories. A collaborative approach is essential when developing a plan for special education students. 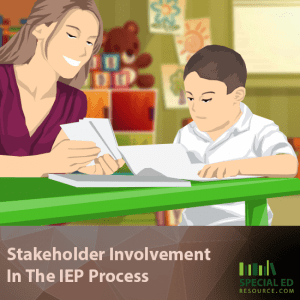 What has been your experience as a stakeholder in an IEP meeting? Please leave a comment so that we can all learn from each other! This entry was posted on Tuesday, March 19th, 2019 at 12:42 pm and is filed under Special Education IEP and tagged as Laura Young, Special Education IEP. You can follow any responses to this entry through the RSS 2.0 feed.